Grilled Jalapeños are better stuffed with shrimp and fish. These can be served with a salad, as an appetizer or even a dessert. An easy and delicious glaze for chicken and steak. Pair this dip with chips or grilled veggies for a shareable appetizer. Try this as a beef steak alternative one night. Top with grilled peaches, avocado, and radishes gently tossed! A colorful variety of freshly grilled veggies on a skewers. Corn on the cob grilled with honey is extra sweet. These pan grilled brussels sprouts will change your mind about eating your veggies. The relish in this potato salads adds exceptional flavor. Sweet n slightly spicy slaw completes any BBQ dish. Poppers stuffed with an explosion of flavor. 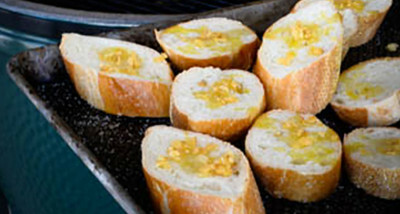 This garlic toast goes great with any main dish. Toss these potatoes on the EGG for a quick yet very tasty side. 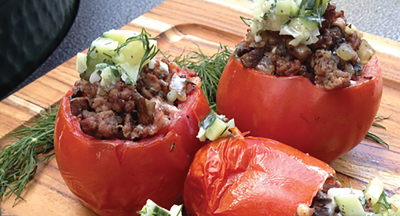 Delicious stuffed tomatoes with refreshing cucumber salsa. An irresistible appetizer with smoked sausage and cabbage.